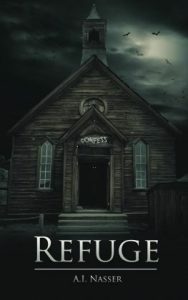 Refuge (The Sin Series Book 2) Release! As a child, I always had a wild imagination, and usually that imagination found its way more to be horrific than anything else. Between the ages of eight and ten, I was sure that a monster walked the second floor hallway of our house, and I was always terrified to go up alone. I would see the monster with its large claws and fanged smile as clearly as I would see my mother washing the dishes and my father correcting papers. And even though my parents always assured me that it was all in my head, I would never believe them. The day I conquered my fear was the day I stuck the handle of a broom through the second floor monster with a loud war cry that had my father screaming at me to keep it down and go to sleep. I have always been of the opinion that there is a very thin line between what is real and what isn’t. Maybe it’s because the imaginary is much more appealing, or it could be that I’m just disconnected from the real world around me. Or a little bit of both. However, that thin line has always been the focus of a lot of fascination on my part, and it’s been something I have loved toying around with in my stories. That’s where Refuge comes in. It’s my little touch on what’s real and what isn’t, what you think happened and what didn’t. And, if you stick through the story until the end, you’ll find me waiting in a nice dark corner where we can sit down and chat all about it. The Sin Series Book 2: Refuge is available on Amazon today! Just make sure you read Book 1: Kurtain Motel first.